the Duke of Weimar. In 1723, Bach was appointed cantor of the St.
and St. Nicholas churches, where he remained until his death in 1750. George Frederick Handel was also born in 1685, in Halle, Germany. England where he became a citizen in 1726.
of texts from the Holy Scriptures. and was buried in the Poets’ Corner of Westminster Abbey. Restoration of the monarchy after the Puritan Commonwealth period. to the organ near the north aisle of Westminster Abbey. Why are these three composers on our calendar? Nothing against Bach, Handel and Purcell – I sing a great deal of their music – but why are they singled out for a commemoration (as are other musicians later in the calendar)? Might a Common for Musicians be more appropriate (as there is proposed for Artists & Writers, page 728 of HWHM)? Bio: If we keep them in HWHM, each of these gentlemen needs a ‘who he is’ statement – and a ‘why he is important’ statement. 1st Paragraph: “As a youngster he studied …” A youngster? That sounds like my great grandmother speaking. How about: “As a young child …” or “As a young man …”? The bio of Bach needs a little adjustment: there is “Lutheran tradition” within Christian faith, but there is no such thing as “Lutheran faith” — such usage simply perpetuates an unecumenical way of thinking and, in fact, compromises the ecumenical intent of the expansion represented by “Holy Women, Holy Men.” On the other hand, it is wonderful to see these great musicians added to the Sanctorale. to show forth your glory in their music …. This, indeed, is a worthy addition! Bach certainly deserves to be in te calendar. The motivation for so much of his music was religious. I suppose the Messiah gets Handel in, and purcell was big in the church music scene. I know nothing about the lives of Handel and Purcell. Were they saintly? I think the collect is wonderful. The Episcopal Church would be a much poorer place without the great tradition of Lutheran hymns. Try to imagine Holy Week without Herzlich thut mich verlangen (Passion Chorale) or Herzliebster Jesu. Many would miss the Easter hymn Christ lag in Todes banden. None of these three were written by J. S. Bach but were arranged/harmonized by J. S. Bach Hymns are a distinct form of confessing the Church’s faith. And the Episcopal Church is endebted to hundred of composers for its marvelously rich Anglican musical tradition which has flourished for nearly five centuries. One can thank the Anglican reformers that they seemed to follow Luther’s lead when it came to music and not that of Jean Calvin where only psalms were sung. One need only look at the composers, arrangers and souces index to Hymnal 1982 to see the Episcopal Church’s debt to the German hymn tradition. A short list would include: J.S. Bach, Johan Cruger, Hans Leo Hassler, Jakob Hintze, Georg Frideric Handel, Johan B. Konig, Martin Luther, Joachim Neander, Philipp Nicolai, Michael Praetorius, Melchoir Vulpius, and others. I have made a point of naming only the Protestant ones. The point I am making is that there should be a commemoration for those who have composed the great music for our liturgy. As wonderful as Bach, Handel, Purcell are I do not know what they have been choosen to be commemorated while others, perhaps less well known, but whose contribution to the Church is as great are not listed. If ever there was a place for “Combined Commemorations,” this is certainly one. Okay, four commemorations then: one for the English, Welsh and Irish composers; another for the German language composers; and a third for the rest of the European composers; and a fourth to cover American music (Sacred Harp, Southern Harmony), spirituals, and African composers. (I hope that there is at least a smile.) But I hope my point is taken. Having Bach, Handel and Purcell commemorated is both too much and too little. Please, rethink these names and consider carefully all the composers. We already recognize those quintessentially Anglican composers, the Wesleys. Perhaps this day could be better used to remember a long legacy of worthy composers whose work enriches our liturgy and our lives. And I did not say anything about authors. About Handel: from what I know about him, he did indeed lead a saintly life and had a vivid sense of the Christian narrative, which he carefully laid out in his choices of scripture in _The Messiah_. It is very inspiring to sit in St. Patrick’s Cathedral in Dublin, Ireland and think what it must have been like in the 1740s when _The Messiah_ was first performed. _The Messiah_ is, and was, a great evangelical work. –I do agree with Suzanne about commemorating other composers whose music also strengthened Christian faith. Placing Bach first appears to be a value judgment. I would place them in birth order. What’s the merit in alphabetical order of last names? He was, of course, also floridly manic-depressive (he wrote “Messiah” in 22 days in which he presumably slept hardly at all; simply COPYING the score of “Messiah” by hand would take a typical copyist more than three weeks). It is perhaps all the more remarkable that he lived a virtuous and productive life rather than self-destructing in some way. Sorry to be a year late on this! 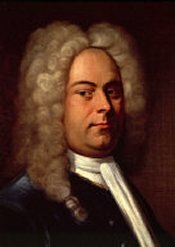 There are some variants on the spelling of Handel’s name (originally in Germany it was Georg Friedrich Händel), but although the English spelling “Frederick” doubtless occurs sometimes, the spelling “Frideric” is now virtually universal. I could see Bach & Handel put together as they were almost exact contemporaries, but Purcell? He was about two generations earlier. I agree that instead of naming just those three–as important as they were–there should be a general commemoration of Church Musicians; to perhaps coincide with the RC St. Caecilia’s Day, as she is associated (erroneously) with music? I am deeply in love with the music of all three, but a commemorative feast day! I’m sorry it’s just ridiculous. Perhaps as someone suggested above a common for musicians. But a separate feast day, why my secretary deserved one at least as much a much as these three occasional church employees. Feasts should be reserved for the conspicuously holy, not for the merely famous. HWHM should be discontinued and LF&F returned to it’s rightful place. Perejean: Thanks for your comment. Next time please use your full name. Thx. — Ed.